Do You Need a New Jackplate? There are two new jackplate options from SeaStar, starting right now. The Jackplate is one of those specialized pieces of boating equipment that comes into play in our corner of the world. Talk to an angler in Seattle or Savannah and they probably won’t even know what a jackplate is. But in Texas, most of the serious fishing rigs are already jacked up. If you need to add or replace a jack plate, some new ones are hitting the water, right now: the SeaStar Jackplate and the SeaStar HD Jackplate. These are hydraulic units, so you can adjust your prop’s depth on the fly. The Jackplate is rated for up to 300 horses (up to 625 pounds), and the HD model is a beefed-up version that can handle a whopping 350 horses (up to 785 pounds). Both have six inches of travel, and can raise or lower that entire range in 8.5 seconds. Setbacks range from four to 12 inches for the smaller model, and four and six inch setbacks for the HD. Controls include a position scale, so you know at a glance just where the jackplate is set. And yeah, these things are intended for the harsh saltwater environment—the stainless-steel guide bars and hydraulic rods are chrome-plated, and the slide mechanisms are fully contained. To learn more about the new SeaStar units visit the SeaStar web site. But, wait a sec—what if you need more height, tilt, and trim control than even a jackplate can provide? Another new option is the Porta Bracket, which provides (more or less) infinite trim and height control. These are much more complex (and yes, that means they’re also a lot more expensive) units. They do, however, provide a very interesting alternative. 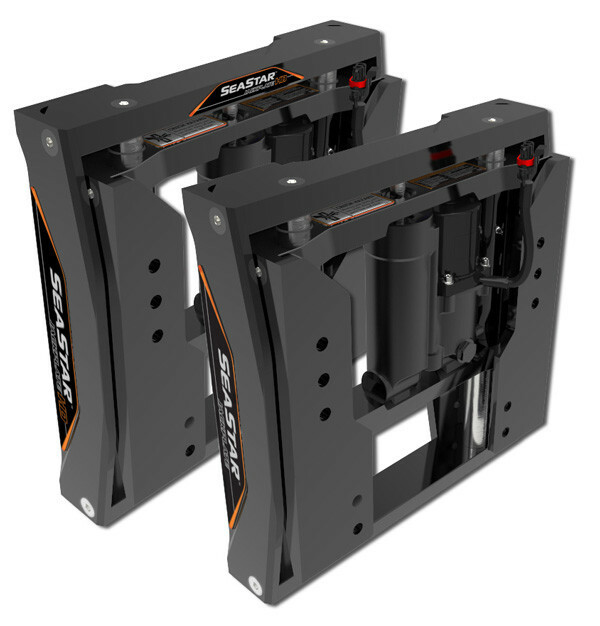 You can see one in action, in this Porta Bracket Outboard Mounting System video.